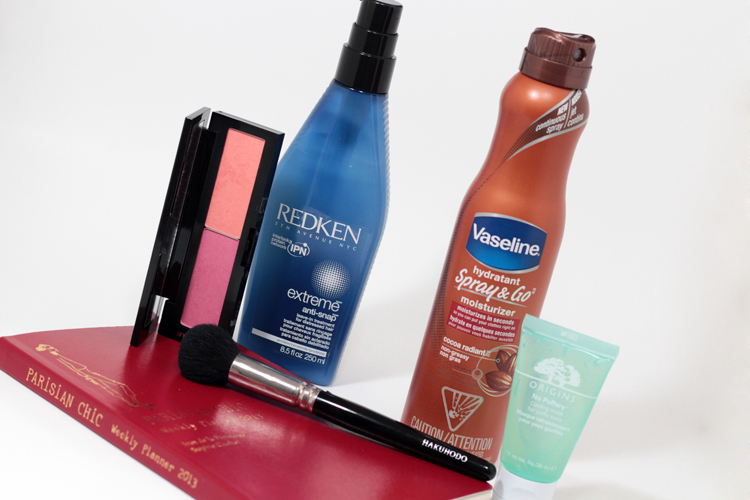 Can you believe it's March already and it's time for another monthly favourites? February was a short month, but it still went by extra quick. Just like this post. I'm a creature of habit & I found myself using the same ol' things this past month. So, here are the products that stood out the most. I've been loving these two blushes. I've been using them together (the peach shade to contour and the pink shade as blush) and I love the results. It brightens and lifts the face. 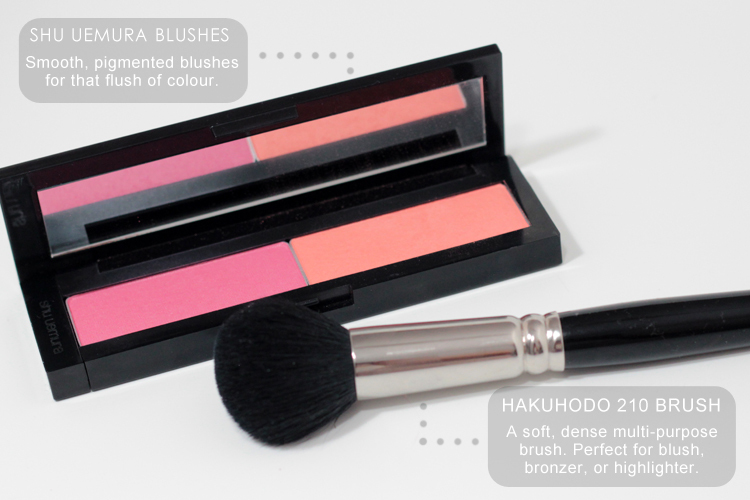 Both blushes are pearl finishes to give a glowing look. When am I not using this brush? I pretty much use this one brush for my entire face: bronzer, blush, highlighter. It's quite a versatile brush. Obsessed. This is a wonderful hair serum. It has really fortified my hair and made it stronger and less prone to breakage. Plus, I think it has helped with hair fallout. Might be wishful thinking, but I have been seeing less hair on the brush. This is such a great idea! I love aerosol sunscreens, so I knew I would love the novelty of this body lotion. It's easy to apply -- the nozzle sprays product lightly and continuously. It's very light on the skin (almost watery) but it's quite moisturizing. Trouble sleeping? Puffy eyes in the morning? This is the product for you! It's a cooling gel that de-puffs your under eyes. I apply a layer under my eyes and within 5 minutes, the puffiness is virtually gone. I also keep this in the fridge to enhance the soothing sensation. Non-beauty related things. I have a couple. These Cable Knit Knee Socks are terrific. They're ideal to use as a lining for your wellies. I use them for any kind of loose boot that I own. They're comfortable and cozy. Fashion & function! I love planners. I never stray too far from my Moleskine, but when I saw this at Chapters, I had to have it. 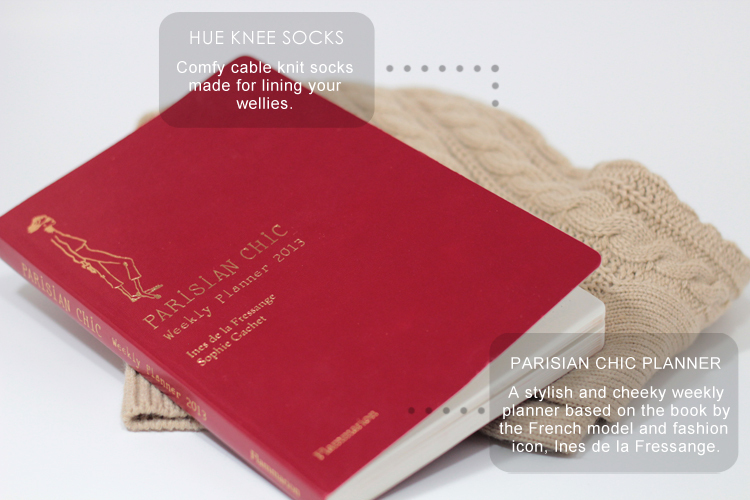 I love the Parisian Chic novel, so I knew I would love this stylish planner. The layout is simple, and while not functional for work-purposes, it's great for jotting down notes & social gatherings. It also comes with 52 tips on style, fashion, lifestyle (one for every week of the year) and charming sketches. 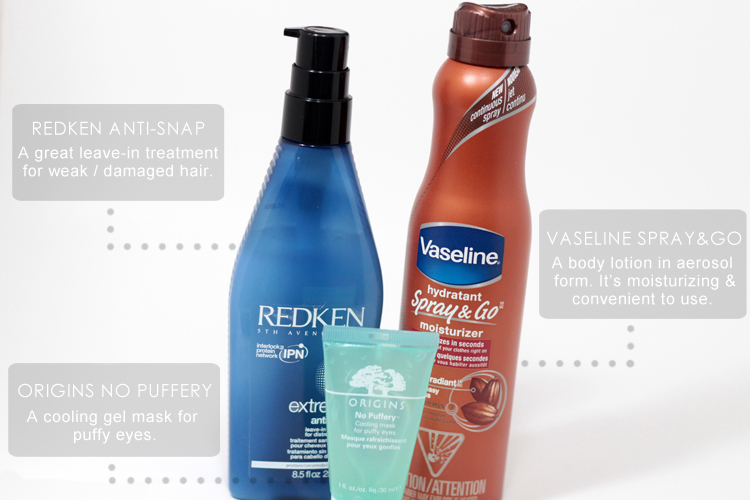 i definitely need to try that vaseline lotion! that looks awesome!